J.J. Tomlinson of Half Baked Casseroles. When picking a Kool Kat for this week, we thought a long time about the ingredients for a Retro Christmas in the South which had to make us think of food. And being the south, that means not just a ham or a turkey, not just sugary cookies—but a feast fit for an extended family with a seemingly endless supply of casseroles made by your mom, your grandma, your aunts and maybe nowadays a male relative or two as well. That tasty thought led us to two Atlanta chef/entrepreneurs Lee Bradshaw Johnson (Dog Days doggie daycare) and J.J. Tomlinson (The Fickle Manor boutique) who this year co-founded Half Baked Casseroles, a Buckhead bakery specializing in the quintessential seasonal comfort food. Traditionally, casseroles became a winter staple because they put good and long-lasting use to winter vegetable and meat staples like potatoes, sweet potatoes and pork—or in my Finnish mom’s case, rutabagas and liver (No, casseroles aren’t just a American holiday tradition!). At Half Baked, Lee’s and J.J. give recipes handed down from their grandmothers a modern twist, with fresh ingredients, no preservatives and all-natural, antibiotic-free, hormone-free meat. The dishes are prepared for convenience, oven-ready or frozen. They come in recyclable pans in three different sizes, and most bake in 45 minutes or less. Larger sizes are available upon request for special events or a hungry family. 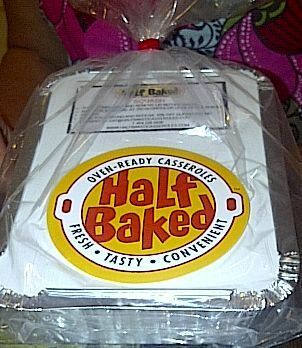 Half-Baked even delivers for a small extra charge or mails gift casseroles to nonlocal family and friends. And if you want to fill out the entire holiday feast, the menu also includes yummy appetizers, soups and desserts! 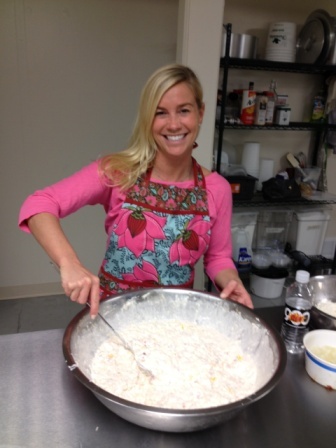 In the spirit of the season, ATLRetro asked J.J. if she’d tell us a little bit about what Christmas casseroles mean to her, what customers are hungry for in the holidays and the lucky side of a special New Year’s treat cooked up to bring you luck in 2012 and even share a recipe! Casseroles and the holidays just seem to go together, especially in the south. 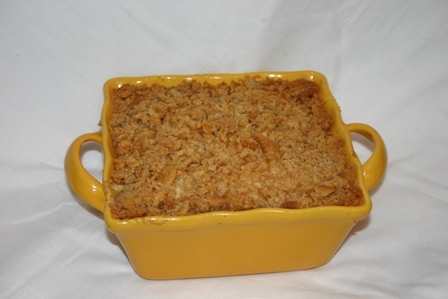 What role did casseroles play in your Christmases growing up and who made them? As a child, my grandmother was the chief cook, and I can’t remember a Christmas without casseroles. My personal favorite was the sweet potato casserole. Every time I smell it, it brings back a picture of Grandma’s holiday cooking. How did you both get the idea of a casserole specialty bakery, and why do casseroles seem to have such staying power? We got the idea for frozen casseroles after my business partner Lee had a baby. She received some casseroles as gifts from friends. Everyone is so busy these days, and we are always in need of quick dinners. We’re guessing you’re pretty busy this week. What menu items are most popular this holiday season? We are slammed this week! Many people are buying appetizers for drop-in guests. All casseroles, appetizers, soups, bread and desserts can be frozen up to three months, too. Which casserole hasn’t been as popular but folks really ought to try it and why? There doesn’t seem to be an item on our menu that people aren’t buying. That may be because we thought long and hard before we opened in order to have a variety that would be appealing. The word-of-mouth aspect has been wonderful. It seems that friends are telling each other about their favorites. Of course, there are also many different tastes and we seem to have something that will appeal to most everyone. Chicken and Half Baked Biscuits. What’s the deadline to mail or schedule a delivery for a gift casserole? We will try to accommodate your requirements for a gift casserole, but as a rule, we need at least one day’s notice. You don’t just bake casseroles, but appetizers, soups and desserts. What other holiday delights do you recommend to start or finish off a meal. My recommendation for the holidays is that you try our pecan pie. It’s crustless, so those calories are saved for the extra rich filling—and maybe some vanilla ice cream to top it off. We also have gluten-free casseroles. 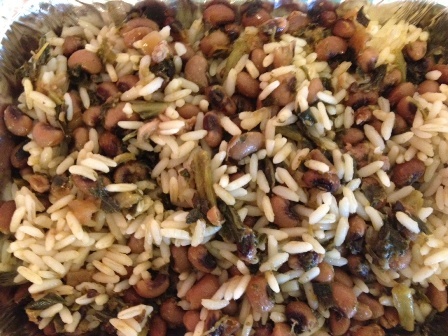 Finally, we understand you’re cooking up a special dish for New Year’s celebrations called the Hoppin’ John Casserole (black eyed peas, collard greens, rice, and pork). Why should we put it on our menu and will it bring us good luck? Southern tradition says that eating Hoppin’ John on New Years Day will bring you good luck and financial rewards all year long. We can’t guarantee that, but you’ll feel mighty lucky when you taste this dish. Soak black eyed peas overnight in water. Drain peas. Add onion, hot sauce, ham hocks, butter, and salt to peas in crock pot. Cook for 8 hours on high. Take bones from ham hock out of black eyed peas. Combine rice, collard greens and black eyed peas into a pan. Cook in oven on 350 for 30 minutes.